As reported earlier this year, Yuri, one half of the YulTi Show! Music Core MC team, has stepped down from her MC role there to concentrate on her upcoming role in the “Fashion King” TV drama. In her place, Taeyeon and Seohyun have been selected to be MCs on the said show. Well, their time on-air has finally arrived 🙂 ! The 2 young ladies took on the show’s MC role for the February 18th episode of MBC’s “Show! Music Core” programme, sans their fellow MC and SNSD group-mate, Tiffany, who is currently in London for the 2012 F/W Burberry Prorsum Women’s Collection fashion show. She has been invited, together with Yoona and Seohyun, to grace the red carpet there, and, at the same time, further spread the influence of Girls’ Generation to more parts of the world :lol:. So, how did our 2 favourite earthly angels do in their debut performance on the show as permanent MCs ? Well, to sum it up in a few words, it was a “cute, aegyo-filled” performance (notice the double “cute” terminology used – yes, it’s that “sweet” 😀 !). Taeyeon, being the more experienced of the 2 in this sort of role (since she was an ex-radio DJ before), displayed the usual confidence expected of her. Seohyun, although still new to this role, did not disappoint either, exhibiting a side of her not often seen, that of the aegyo-filled, fun-loving performer :). All I can say is, if this is a sign of things to come, when Tiffany returns from London to add her “Fanytastic cuteness” to, and complete, the MC-trio combination on the show, future “Show! Music Core” episodes will never be the same again ;). Why ? Well, because now you will have thrice the aegyo and cuteness displayed on-air, making all viewers potentially “diabetic” very soon 😆 ! Check out the MC cuts from the show below and see if you disagree with me. Enjoy ! Yes, I’ll have to agree with you, Kenneth. I’m wondering though… if Tiffany was there for the fashion show… how could Seo be there? snsdjjang ssi, gwaen chanha, jeoneun molla yo !!!!!!? soshilove ssi, gomab seubnida !!!!!? Seobaby!! 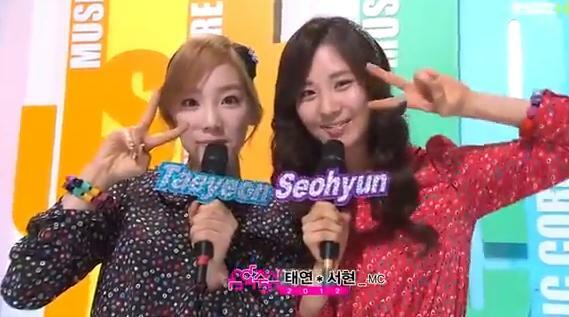 Soo cute with Taengooo 😀 I love how they mc’ed throughout the program, maknae and leader fighting!